This adapter can't convert voltage. - It's well designed to be portable in size with a simple and practical style. SPECIFICATIONS - Power Rating 6A max, 100 - 240Vac (660W max at 110Vac; 1380W max at 230Vac). 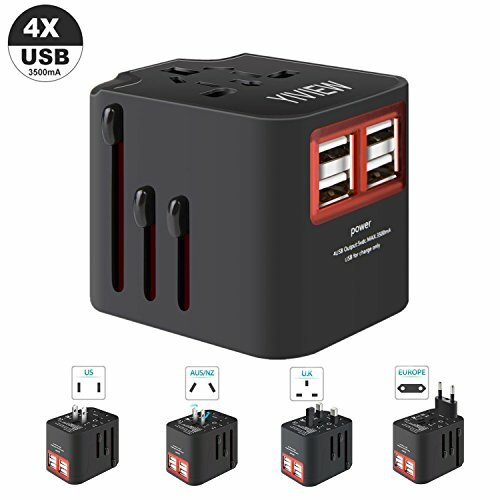 The travel adapter does not work with high power appliances such as hair staightener, flat iron, hair curler, hair dryer, steam iron, hot water heater, coffee maker, etc. Multiply-Purpose Usage: Whether it's the wall plug you need, or the integrated USB slots, we've got the device for you! With compatibility ranging from cell phones and Bluetooth speakers, to camera, tablets, go travel with it and you will never be without power no matter what your needs! If you have any questions about this product by YIVIEW, contact us by completing and submitting the form below. If you are looking for a specif part number, please include it with your message.